Wood fireplaces and chimneys, just like gas fireplaces, require regular cleaning and maintenance to keep them working safely and efficiently throughout the winter. We’re in Canada – a cold snap can roll in at any time. It’s better to be prepared and ready the minute Old Man Winter decides to stop in. This is exactly why we at Safe Home Fireplace recommend having your wood burning chimney swept in the spring/summer months. This ensures you don’t have to worry about fighting the crowds to get your fireplace taken care of when the first snow hits. Think of it like winter tires, better to put them on early then to not be able to get an appointment until winter is half over. Why do I need to clean my wood burning fireplace and chimney? Great question. Over time, creosote will start building up inside your chimney. Its a black soot like build-up that turns into a kind of thick pasty substance. Creosote can eventually block your chimney and keep smoke from escaping through the top of your chimney. If the smoke can’t get out the way it’s supposed to, it can end up going backwards into your home or potentially causing a chimney fire. Can I clean my wood burning chimney myself? Sure! You can pick up a chimney brush and a pole to attach it to and get up in there yourself. It can get messy though if you’re new to the job. We suggest putting down lots of drop clothes to reduce mess. Our technicians are trained a lot before they’re sent out to clean your chimney – you can rest assured that our guys will not be making a mess in your house. 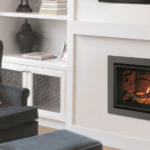 When should I clean my wood burning chimney and fireplace? At least once a year is a general rule of thumb. Of course this can vary depending on how often you use your fireplace. Having it cleaned at least once a year should ensure any buildup is removed before it becomes a problem. Like we said, we recommend having it cleaned in the spring. Companies (like us!) aren’t as busy at this time of year, so the likelihood of you having to wait to get an appointment is much lower. This also means that as soon as the first chilly night hits, you can rest easy knowing your fireplace has already been cleaned and is ready for burning. Give us a call or send us an email today to book your annual wood burning chimney cleaning. Tags: chimney cleaning, fireplace cleaning, fireplace maintenance, wood burning fireplace, wood fireplace.